Thomas George Poholsky (August 26, 1929 – January 6, 2001) was an American professional baseball player, and a pitcher in Major League Baseball from 1950 to 1957. 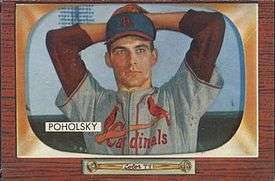 Born in Detroit, Michigan, Poholsky appeared in 159 games, 104 as a starting pitcher, for the St. Louis Cardinals and Chicago Cubs. A right-hander, he stood 6 feet 3 inches (191 cm) tall and weighed 205 pounds (93 kg). He never had a winning season in the Majors, but had a stellar minor league baseball career, posting 16–3 and 18–6 seasons in the Cardinals' farm system and compiling an overall minor league record of 80–54 (.597). As a minor leaguer with the Rochester Red Wings, he won the International League Most Valuable Player Award in 1950.